Where did the summer go? This summer was short and mild –OK, it was actually unseasonably cold. September 23rd marked the beginning of Fall with schools back in session, shorter and shorter days and beautiful weather. For me, however, I’ll know the season has changed when I hear the characteristic song of the Golden-Crowned Sparrow: “oh dear me.” And along the bay, it won’t be long before migratory ducks fill the ponds and waterways. During the past two months, I’ve made the usual rounds of the bay lands but honestly, it’s been rather dull. I prefer to photograph birds in their most striking plumage rather than the relatively drab appearance of most during the summer. But this summer was exciting for one unusual encounter. Redwood Shores is notable for it’s numerous man-made ponds and lagoons providing an attractive visual amenity to the adjacent townhouses and homes. These aren’t stagnant bodies of water but rather connected to the bay with submerged pipes allowing fresh water to circulate as well as providing access for a variety of interesting wildlife. I have seen bat rays, leopard sharks and even seals in these ponds. While I’ve observed groups of Pacific Harbor Seals hauled out on secluded rocky spots in the S.F. Bay, I’ve never had a close encounter with one until this summer. No doubt, the Redwood Shores ponds are a safe place for a mother seal to have her single pup. And it was in one of these local ponds that I saw the seal for the first time around Memorial Day (of course, I didn’t have a camera with me on that occassion). This pup was already fairly large, maybe about 35 lbs. So, I’m guessing it was born in March or April –which would correspond to the normal time frame for newborns. And like about 20% of the harbor seals in the S.F. Bay, this little guy has an orange or rusty colored coat. Over the past several months, this plump pinniped has grown and appears quite healthy. What is unusual, however, is that this little seal appears to be quite curious of its surroundings, including people and dogs at a dog park as well as folks strolling along the Bay Trail. According to the Marine Mammal Center, it is not normal behavior for a harbor seal to initiate contact with people or dogs. But I have watched this seal swim across a lagoon in order to get closer to people, even those with pets. I too have been the object of this seal’s interest. While set up on the rocky shore of a pond photographing a green heron, not 10’ away from me up popped the seal’s head out of the water quite unexpectedly. 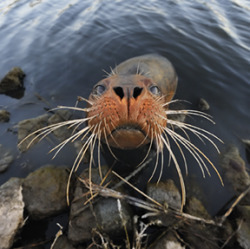 The seal did a 360 degree spin and then made a bee-line to my position for an up close and personal look. It was pretty cool to look directly into the big dark eyes of this curious juvenile with it’s friendly dog-like face. If I didn’t know better, I’d say it was lonely and wanted to play.